Among the smoke, noise, crowd and stink of the bustling city lies the vast, green Viharamahadevi Park. The landscape of this park is decorated with blooming flowers, pretty lotus ponds, thick grass, calming fountains and huge, shady trees, being a perfect place to relax and release all tension. 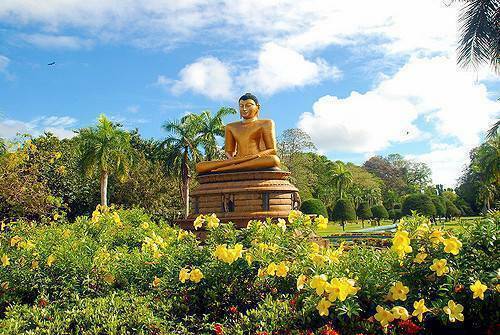 Situated just opposite the famed colonial Town Hall, the park includes golden statues of the Buddha, Queen Victoria and Queen Viharamahadevi, symbolizing its majestic heritage. One can hide away on a small bench below an enormous tree, or take a stroll through the paved walkways around the gardens. Children can enjoy on the jolly toy train, interact with baby animals in the tiny zoo or observe fishes in the mini aquarium, all within the park’s grounds. Plenty of local stalls serve tasty treats and snacks for everyone. Hence, Viharamahadevi Park provides an opportunity for the whole family to have picnics, or just spend a peaceful and pleasurable evening together!